During the school summer holidays we hold our Pack Evenings outdoors, either at our Scout camp site at Horley or other outdoor venues. On this Pack evening, we had been invited by Emma and Martin Hamer to visit their farm in Horley, where Emma and her son William and daughter Lucy gave us a very interesting tour of the farm. 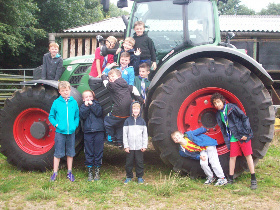 During the course of the evening, the Cubs met the new piglets, helped feed the pigs, looked at the tractors and other farm machinery and learnt about the difference between hay and straw. We also had a walk into the hayfields where round bales of hay were dotted around the fields. To the delight of the Cubs, they were allowed to jump onto the bales although this did prove easier said than done in some cases. All good fun though. The evening ended with Emma serving drinks and lollies to the Cubs before they were picked up by their parents. A very enjoyable and informative evening.